I realize I haven’t posted any Bengali recipes in awhile. I’ve been cooking Bengali food – but it hasn’t been all that pretty, especially when I am rushing around and getting ready to serve dinner by a certain hour so that L can eat with us (after which, she is covered with food and must go right into her bath). 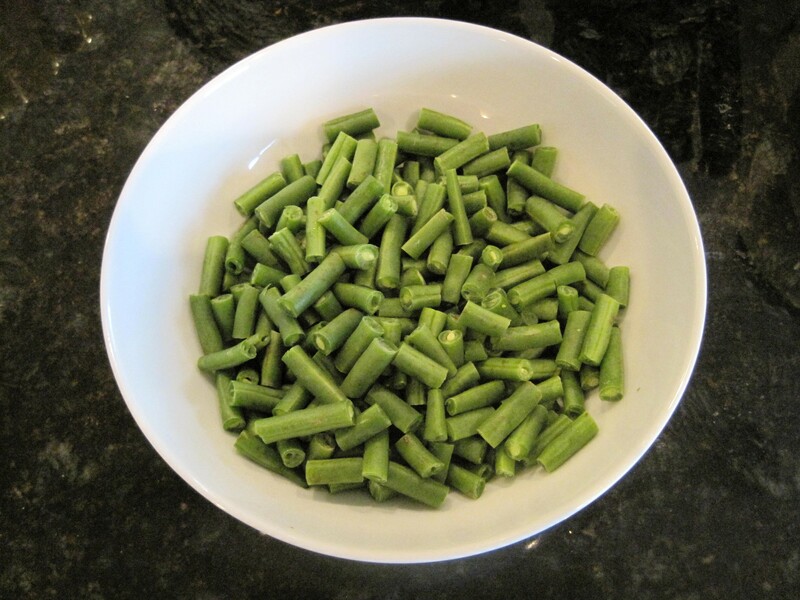 Last week was a little more forgiving than the others, and I found slender, darkish green beans at the produce market. Soft to the touch, they were coated with a hint of fuzz that always reminds me of the beans my father grew in our garden. How could I resist? For those accustomed to mustard and coconut in a dish, the combination hardly seems opposite. Rather, it is an extremely popular way to serve a wide variety of vegetables and fish, and it is as common to Bengali cooking as mustard and ketchup are to American dishes. Preparing fresh mustard is a little work but can be done in advance. European and Chinese mustards are not a good substitute. A mini blender is necessary. 1. Blend mustard. Set aside. For instructions on how to blend mustard, please visit the section on Basic Mustard Sauce in the Departures post. 2. Blend grated coconut with a little water and the grated ginger until the coconut becomes a little more creamy and uniform. 3. Prepare the phoron (oil and seed) mixture: In a large saucepan, heat the oil until it shimmers and then add the fennel seeds, green chili and tej leaf. When the fennel seeds begins to darken slightly (about 2 minutes), add green beans. 4. 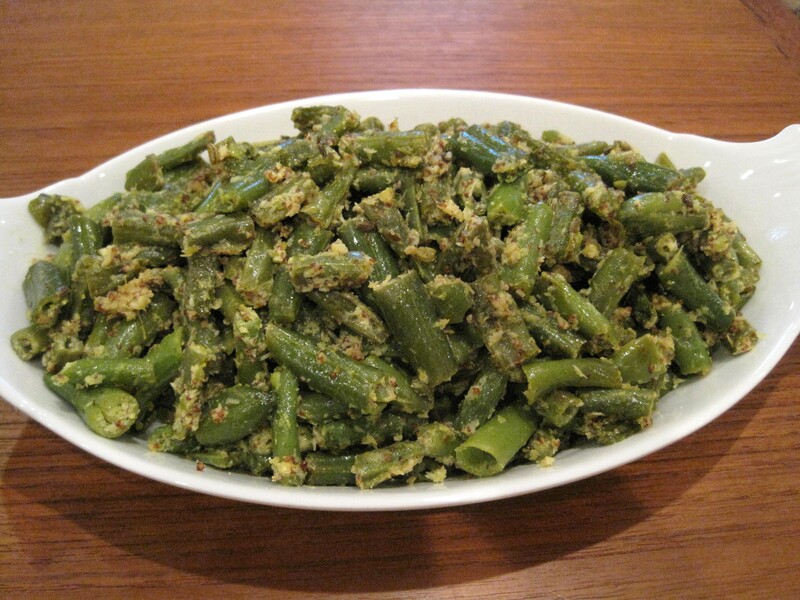 Cook green beans until al dente, then add 2 tbsp mustard and 4 tbsp coconut, turmeric and salt. 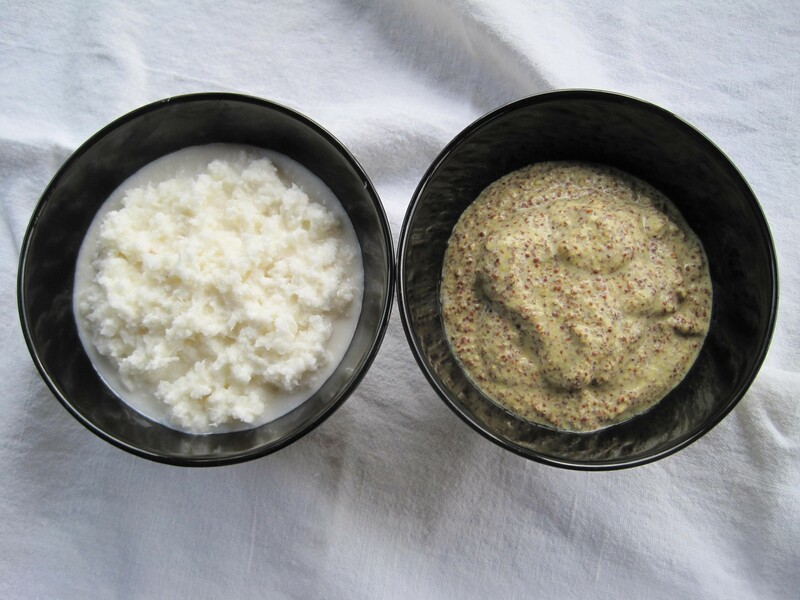 The amount of coconut and mustard can vary, depending on taste, but the ratio of coconut to mustard is 2:1 (double the amount of coconut to mustard). Add a pinch or two of sugar to balance. Cook another 5 minutes, or until beans are done and slathered with bits of chunky spiced coconut. 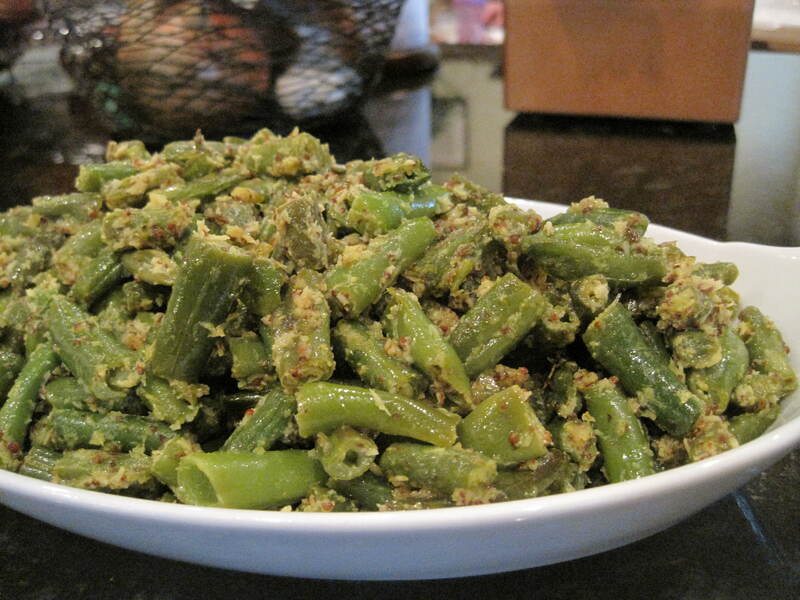 This entry was posted in Bengali Food, Coconut, Green Beans, Mustard, Vegetables and tagged Bengali Vegetable Dish, Coconut, Green Beans, Mustard, Narkel, Shorshe. Bookmark the permalink.